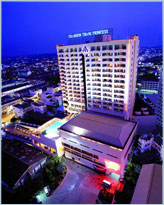 Khon Kaen is the major city center of Thailand’s historic northeast region. The city has everything from centuries-old heritage to modern architecture enticing visitors from around the world. Charoen Thani,Khon Kaen is perfectly situated to help you discover and enjoy the gracious royal splendor of the region. The hotel offers 320 spacious guest rooms and suites, which are finely appointed and boast international standard amenities. The service is international in quality, efficient and reflects the courteous charm of the area. For your leisure moments, there is a fully equipped Fitness Club and swimming pool. For night time entertainment, there is the Showtime Karaoke Hall and 147 Snooker Centre. For a superior dining experience, enjoy authentic Chinese dishes courtesy of the Tycoon Chinese Restaurant or savour sumptuous international cuisine at Graceland . There are also full banqueting facilities plus a Business Centre to serve all your needs.